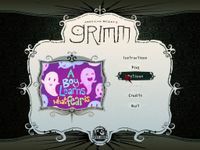 When a young boy goes on a quest to find the true meaning of fear, his trek takes a turn for the darker when Grimm appears to muck things up! Traverse on a quest for fear through the boy's hometown, the gallows, a local school, a graveyard and a haunted castle...and that's the uplifting part of the story! Happily ever after ends now!